Just one quick call is all it takes to get your out of control storage unit nightmare handled. We can whip any messy storage space in to shape with a little muscle and teamwork. Once you throw away or donate all the unwanted items in your storage unit, you may be able to down grade to a smaller size saving you lots of money each month. Not to mention how great you will feel when that old stuff is gone! Often the unwanted junk we haul away from storage units makes a great dbonation for the Goodwill or Salvation Army. If we can donate usable items you no longer feel like storing fo a rainy day, we will. This keeps your garage junk out of the Sonoma County landfill saving money on disposal fees. It also helps local Santa Rosa area falmilies who can use it. Have you ever considered parking a car in your garage? As crazy as that sounds, some people do it. You could too, if you took a few hours to clean out clutter and old junk or debris that is taking up your valuable space. Household junk has a way of buliding up, escpecialy when you have lived at a home or apartment for more than a few years. When it's time to be honest with yourself and part with household goods and items that your never going to use, call Sonoma County Waste Dispsosal Service for next day junk hauling anywhere in Sonoma County including Santa Rosa, Petaluma, Forestville, Rohnert Park, Cotati, Sebastopol, and Windsor, CA. Donating your garage junk is always a good idea. You won't believe how good a clean garage or basement can make you feel! Moving boxes, old bicycles, used sports equipment, garage or rummage sale left overs, old clothes, pictures and frames, or auto parts can all be hauled away by our rubbish disposal service. Household junk pick-up is our specialty. We remove garbage and debris from over 35 local home and business owners a week. Big or small dump runs are OK!. We are ready to tackle any spring cleaning project big or small! The basement may be a scary place for you but our rubbish removal teams are fearless. Dust mask equipped, we will dive into any dark basement or attic and remove whatever needs hauling regardless of the danger that black widows and other creep crawlers may pose. A tiny mouse can't stop our debris clearing experts. We love mice and all creepy creatures no matter how small and have saved over 200 creatures who were displaced by our junk hauling projects. If a salamander, lizard, mouse or even a spider made thier home in your disgarded basement debris, they will be gently removed and placed outside where they can find new friends and be free. Storing household items and furniture can get expensive over the years. The storage unit may end up costing you many times more that your furniture and personal items are worth. Sentimental value is one thing but when it comes down to dollars and sence, it may be smart to let your storage space go and clean out the old furniture and boxes of books and old clothing. No matter how good a deal you got on your monthly storage bill, it's only meant to be temporary. Once you rent it for a year or more you have spent too much! Get the items in your storage organized and determine what you really need to keep. Haul away of what you don't need is easy and affordable with dump runs service starting at just $49.00! Garage space can be yours again once you let us haul away your household items to the Goodwill or Salvation Army for donation. 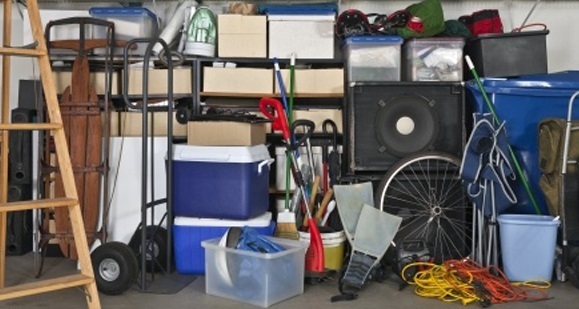 Your attic or basement may contain items the Goodwill won't take but that are still usable. We have our own list of families in Sonoma County that are in need of old clothes, furniture or unwanted items and we donate just about anything to local residents all year around! The garage or attic may not be the only area of your home that needs to be cleaned up. Perhaps someone moved out and thier personal belongings have been left behind. The kids may have moved and you have thier old beds and mattress sets still hanging around. Not to worry. Turn the kids room into the new office or den! Just start hoofing the household items to the garage or driveway and we will be there when scheduled for quick and easy junk pickup or donations pickup service. The dump runs service we offer starts at just $49.00 in the Santa Rosa area so it's affordable to have your junk hauled away by our proffesional removal service. Since we recycle most the rubbish we haul away, all your old cardboard moving boxes and used packing material can be recycled by us at the same place we dump the refuse and trash. Old furniture, antiques, and your old stored donatable items will be passed on to new owners where they can have a new life (without you). Donate your usable household goods to a local charity. If you would like to schedule a free pickup of donatable items click here. The preceding link will take to to Donation Town where you can enter your zip code and get of list of charity organizations that will pick up your donations for free! It may take a week or two to get an appointment and if you have alot of junk, there may be a few items they can not take away. If you need your junk removed quick style and you can't wait for a free donations pickup service to arrive, call us for next day household junk pickup service anywhere in Sonoma County. We can provide quick and affordable couch removal, mattress pickup, appliance disposal, furniture pickup service, yard waste disposal, wood and scrap lumber recycling, and concrete removal anywhee in Sonoma County, CA. Price is for pickup and removal of up to 800 pounds of furniture or junk in Santa Rosa, Rohnert Park, Cotati, and Winsdor CA. Recycling a couch is not always an easy task. Donation of a couch is a little easier. There are times when the sofa we remove is too grungy or ripped up to doante to a local family. Most local families are not picky when it comes to a free couch or sectional sofa set. However, there are case where the couch or love seat can not be saved. In those rare cases we are still able to help your couch live on in the the form of recycled material. Having seen the inside of hundres of sectional couches and reclining sofas, I can testify that aside from foam padding and fabric, the rest of your couch is made of wood and metal. Hide-a-bed sleeper sofas and recliner sofas contain the most metal. With a few zips of our screw gun and a few sledge hammer swings we can separate your old sectional couch in to wood an metal that can be recycled! We can also recycle your mattress and box spring bed set! 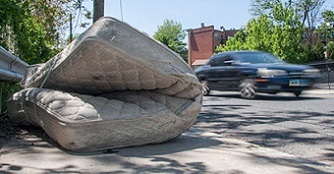 Mattress disposal is easy when you call our green junk hauling company. Based in Santa Rosa, we service the entire Sonoma County area offering the lowest price on pickup and disposal of bed and mattress sets. Your old mattress and box spring are definately too big to fit in your garbage can from the city. Mattress & box spring removal starts at just $49.00 in Santa Rosa, CA. That means our junk hauling crew can pick up you old bed and dispose of or donate it anytime at a price that fits your budget. Most local charity orgonizations won't accept a mattress for donation. If your mattress is still usable we can donate it to a private party here in Sonoma County. We have our ways of finding homes for furniture that still has some life in it! Call (707) 922-5654 for next day removal of your bed, mattress or box spring set. Large appliance disposal is easy when you recycle! The appliance pickup service at Sonoma County Waste Dispsosal Service can remove your refrigerator, washing machine, clothes dryer, or hot water heater at an affordable price anytime 7 days a week. 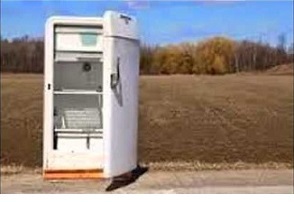 We recycle every appliance we pickup. Than means your microwave oven, stove, or refrigerator won't end up in the Sonoma County landfill where it could leak harmful chemicals into the environment. The large appliances we remove are disposed of responsibly at the local Santa Rosa appliance recycling facility. We can provide next day removal of appliances anywhere in the Santa Rosa area including Petaluma, Rohnert Park, Sebastopol, Cotati, Windsor, and Forestville, CA. KItchen appliances and small household appliance pick up service is also part of the junk hauling list of things we do. Call today for a free quote on pick up and removal of rubbish at your house. We are ready to haul! We are available for next day haul away service anytime 7 days a week. This 100% green junk hauling company is commited to keeping Sonoma County green and clean. We guarantee the lowest price on cleanup and removal of anything you want to disappear! Storage unit cleanout and garage cleanout service is available 7 days a week in Santa Rosa, Petaluma, Windsor, Rohnert Park, Cotati, Sebastopol, and all Sonoma County. 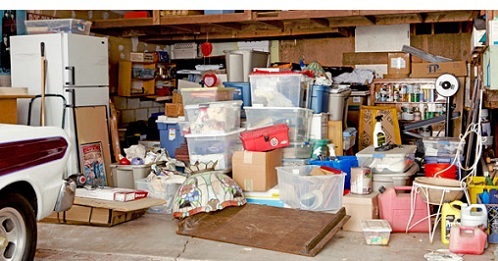 Call us at (707) 922-5654 for quick and easy clean out of your storage space, basement, garage, or attic. Time ot get organized! 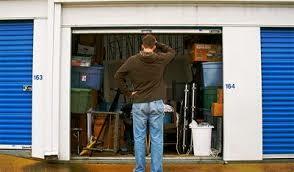 With all that clutter out of your life you will breath easier and feel more relaxed in your garage or storage unit. We can pickup and remove small amounts of rubbish that is trashing up your space. From just $49.00 haul away unwanted boxes or garbage. Big or small cleaning projects are OK. You may just want to clean up the garage a bit but you have more household debris than can fit in your city trash can. Just make a small pile of the junk or cardboard boxes you need gone in the corner of your garage or driveway. One call to Sonoma County Waste Disposal Service and your unwanted junk will be removed by the next day, leaving you with a clean and clutter free space. Moving out of your storage unit? We can clear out the entire space and then sweep out the dirt and dust so you can get your deposit back! We do it all the time so we know what storage companies like when it comes to cleaning out the units. Have some of the garbage hauled away from your storage even though you want to keep it. Just go through the unit and start slinging the trash and unwanted items you would rather live without and we will haul away the junk, leaving you with a peaceful storage space!